My girls love field trips. There are so many things you can learn while you are out exploring or on vacation. 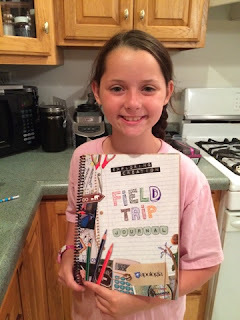 Now we have a great way to keep track of the field trips we go on by using the Exploring Creation Field Trip Journal from Apologia Educational Ministries. The Field Trip Journal is a colorful spiral bound notebook that has the look of a scrapbook. It is divided into 9 sections that help you prepare for and record the field trips you take. There is a checklist for preparation, lists of ideas from your backyard to around the world, maps to record and see where you are going, and prompts to help you record information and draw pictures. With the Journal you also gain access to book extras at the Apologia website. The list of extras for this book is amazing. It tells you why field trips are important, there are links to virtual field trips, state maps, information about art journaling, field guides and identification resources. We love the list of field trip suggestions in the book. There are so many things listed that we hadn't thought of or my younger kids have never been to. We looked through the list to chose places we want to go. I knew as soon as we received our Field Trip Journal in the mail that Alaina would be the one to fill this in. She loves things like this and she was overjoyed to start filling it in. It actually came at a perfect time. We went to CO to play soccer and visit our oldest daughter that lives there. We had originally planned on going to Trail Ridge Road in the Rocky Mountain National Park, but there was still too much snow so it wasn't open. We decided to take a drive in the mountains and decided to stop at the ARGO Gold Mine & Mill in Idaho Springs, CO. As soon as we were back at our daughter's apartment Alaina wanted to write in her journal. She was especially excited about panning for gold. 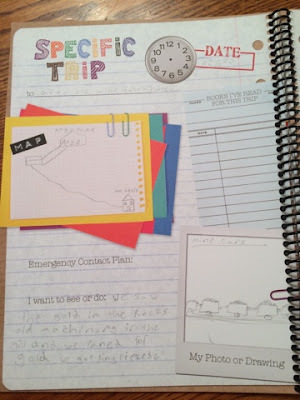 She used some of the Specific Trip pages and an As I See It page for this trip. She wrote about what she wanted to see, what we did for the day & something she will never forget. On her As I See It page she drew a picture of herself panning for gold and actually finding a large nugget. There is a section in the journal called My Special Spot that is an ongoing project that covers all four seasons. Alaina was excited to chose a special spot & she can't wait for the next season to fill in another page. 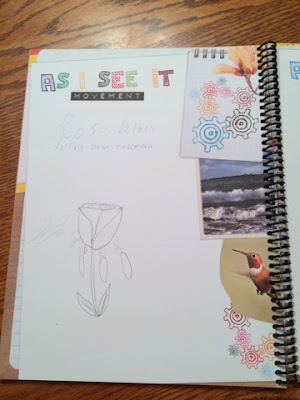 I think this journal is a great way for a student to record the field trips the take. Not only is it educational to record information, the final journal will be a beautiful keepsake that Alaina will never want to get rid of and I can see her pulling it out to show her family members when they come to visit. We will keep this with our scrapbooks and picture albums once it is finished instead of storing it with the finished school work.